September was a fascinating month. YouTube operates a number of Spaces throughout the world that are available to its larger producers. The resources are fantastic, including cameras, multiple stages, green screens, courses and professionals on staff that can help you operate everything and teach you how to improve every aspect of your channel. To access most of these spaces, you now need to have 10,000 subscribers. But last summer the Berlin space was just getting started, which meant that they were happy to take anybody who had more than 1,000 subscribers. As of July of 2015 that included me. My month in Germany was great. I got to meet a lot of people who understood what I was doing, which was a pleasant change. 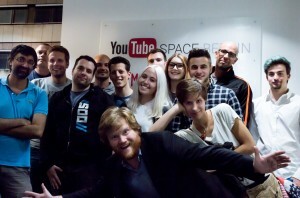 The workshops I did, with input from directors, and fellow YouTube producers were fantastic. It’s amazing how something as basic as an Adobe Premiere keyboard shortcut can revolutionize production. Everyday at the space I learned something new. There were drawbacks as well. I didn’t realize just how weird what I’m trying to do is until I got there. The other video creators were lovely, but none of them were trying to do any political content. The YouTube market wants video gaming and make-up tutorials, not political essays. My audience is one that I have to build from scratch. Also, I couldn’t really use the resources on offer for video production. My work isn’t exactly what you’d call strictly compliant with traditional approaches to Intellectual Property. I’m confident that everything I do fits under an expansive view of “fair use”, but Google is not interested in helping to produce anything that doesn’t fit under the strictest interpretation imaginable. To produce something at the studio I would have to track down permissions for every video clip and photograph I used. It just wasn’t possible for the videos I was producing that month. With some planning, I am confident that I can fully use this resource at some point in the future. Berlin, by the way, is fantastic. The museums and cultural offerings are all top notch. More importantly for my purposes, the history is unparalleled. It’s got everything. Highlights for me included the Hohenzollern palace at Potsdam, and the alien like Soviet war memorial at Treptower Park. Somehow, between all the walking and the learning, I managed to produce six videos this month. The first was the product of some incredibly good luck. In the first week of September, the Syrian refugee crisis came to a head at the Keleti Palyaudvar train station in Budapest. This happened to be a 10 minute walk from the AirBnB I was staying at. My footage from the train station became the centerpiece of “The Syrian Refugee Crisis Was Created By US Policy“. Next up was “Deez Nuts Is More Serious Than Donald Trump” which uses one of my favorite stories from the early election cycle to take a quick jab at Donald Trump. “#BlackLivesMatter Does Not Cost Black Lives” is a preemptive attack against the growing chorus of voices claiming that the “Ferguson Effect” keeps cops from doing their jobs. “Why Rudy Giuliani Makes Me Angry” is my least watched video of 2015. This is frustrating because I still think it’s quite cleverly constructed. But if I’m going to complain about a politician, I shouldn’t deconstruct the rant, as I did here, I should just go ahead and rant. “3 Reasons Refugees Are Awesome For Germany” was another bit of preemptive propaganda. In September Germany was pretty pleased with itself and its generosity. Less so now. Sometimes the Military Industrial Complex really makes it too easy. A Harvard think tank’s offensively idiotic report forecasting imminent war with China prompted “Harvard Is Trying To Kill US! China, Think Tanks and War“, this month’s second installment in the Military Industrial Complex series. 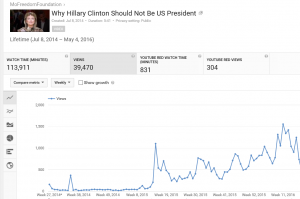 Views fell a bit in September 2015, falling back down to 13,002 from 16,485 in August. One of the top five, and two of the top ten videos in September were produced in September. None of the six videos crossed 100 views on their first day. 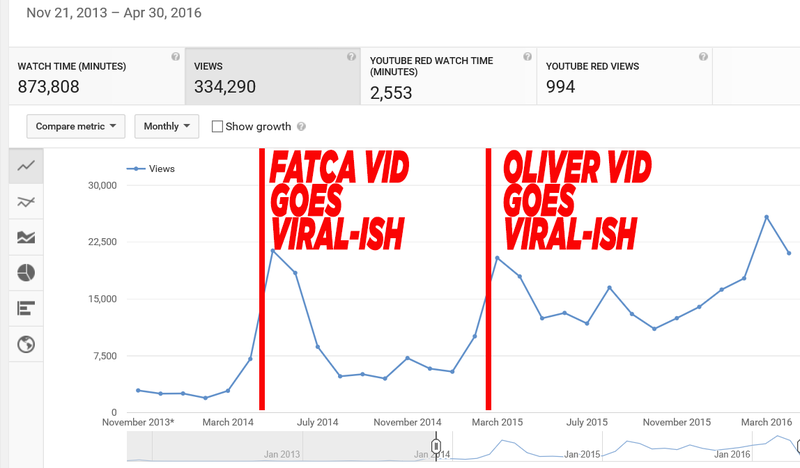 8 months later, five of the six videos have topped 200 views, and two have topped 700. 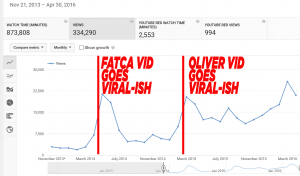 At the end of September 2015 we had 119 videos, all but one of which were viewed in September, 76 of which were viewed more than 10 times, 17 of which were viewed more than 100 times, and four of which were viewed more than 1,000 times (FATCA, John Oliver, Hillary Clinton, Syrian Refugees).